On the day of his discharge from the United States Army, Sgt. Isaac Woodard, a decorated veteran, was beaten and blinded by a small-town police chief in South Carolina. Woodard, like other returning black World War II veterans, had expected that his wartime service would entitle him to respectful treatment and the full benefits of American citizenship once he returned home. But he quickly discovered that little had changed in the South while he was gone. Jim Crow laws remained in place and black disenfranchisement was the rule. On that February day in 1946, Woodard refused to assume the docile and subservient role expected of him. He paid a tragic price. Woodard’s case would generate a cascade of events. After the NAACP embraced Woodard’s case as part of its campaign against post-war racial violence, Orson Welles featured the Woodard story in four nationally- broadcast programs on ABC Radio. Mass meetings in black communities across the United States spurred breakthrough civil rights action by President Harry Truman. Although an all-white jury exonerated Chief Shull, Woodard’s case motivated Truman to take action by creating his Commission on Civil Rights, the first national civil rights commission, and to issue his executive order ending segregation in the armed forces. The trial would also move the federal judge who presided over the case. Judge J. Waties Waring was no civil rights pioneer, but the Shull trial galvanized the eighth-generation Charlestonian to commit the balance of his career to using the law to advance the cause of civil rights. Waring’s dissent in the case of Briggs v Elliott, in which he called school segregation unconstitutional, was the first of the four cases that would be consolidated as Brown v Board of Education. And the words in Waring’s dissent would form the legal basis of the Supreme Court’s landmark decision. 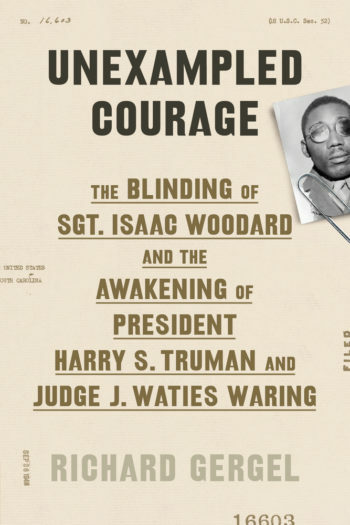 While it is largely forgotten today, Julian Bond would call the blinding of Isaac Woodard “the spark that ignited the modern civil rights movement.” And in Unexampled Courage, Richard Gergel, who is himself a federal judge and presides in the courtroom where Judge Waring once served, captures a piece of history that we need to remember. Gergel is both an astute researcher and an engaging writer, bringing this significant story to vivid life … Civil rights history at its most compelling.